Your website is an excellent means of education for the GSD enthusiest. Thank you for the continued work and dedication to this magnificent dog. I have a great little story I wish to share. My mother and her family from the mid sixties up until late eightys used to breed GSDs for police and for the dedicated owner out of the Basendorf Kennels in the U.K. The word spread across England that the GSDs from the kennel were top notch and soon enough a "special customer" wanted to buy the two best dogs from particular litters!! Dumbfounded by the anonymous potential buyer who didn't want to be named, my grandmother reluctantly arranged a meeting. The day came in August 1981 my Grandad was waiting out the front when a black limousine pulled up! and out hopped a man dressed in dark glasses and bodyguards. He hurried them inside and soon found it was none other than Ringo Star from the Beatles!!!! He wanted two shepherd pups - a black and tan and a Sable. They got autographs he payed and left rather rather happy. My mother who is a fan was hysterical! 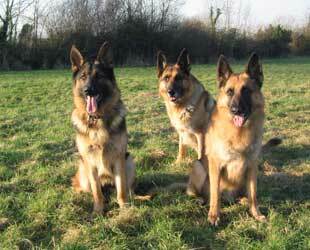 but in the end it goes to show that GSDs rule!!! I'll try and dig up a pic or two from the old days and of the dog I own as the fourth generation of GSD lover in my family lol! Hi Luke, Thank you so much for sharing your great German Shepherd story with us. What a wonderful story. And I'd like to take the time to say thanks to all our visitors for reading your story along with us. And here’s the challenge to all the visitors of Total German shepherd - if you get the chance, please come back often to see what else is going on in our growing German Shepherd Dog community. BTW, please tell us also exactly what you think about the above story by leaving some interesting comments below.